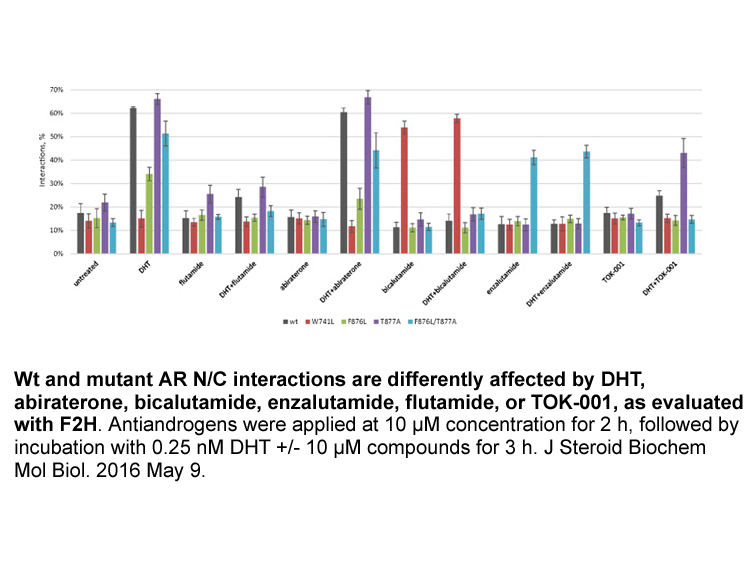 Description Abiraterone is a potent inhibitor of CYP17 with IC50 of 2 nM. Microsomes were diluted to a final protein concentration of 50 g/ml in the reaction mixture which contained 0.25 M sucrose, 20 mM Tris–HCl (pH 7.4), 10 mM G6P and 1.2 IU/ml G6PDH. After equilibration at 37 ℃ for 10 min, the reaction was initiated by addition of NADP to obtain a final concentration of 0.6 mM. Prior to the distribution of 600 μl of the reaction mixture in each tube, test compounds were evaporated to dryness under a stream of nitrogen and then were incubated at 37 ℃ for 10 minutes. After incubation with Abiraterone, 500 μl of the reaction mixture was transferred to tubes containing 1M of the enzyme substrate, 17OHP. After a further 10 min incubation, tubes were placed on ice and the reaction was stopped by addition of 0.1 ml NaOH 1N. Tubes were deep-frozen and stored at -20℃ until assayed for Δ4A levels. A Δ4A RIA was developed and automated on a microplate format in our laboratory using a specific antibody against Δ4A. The separation of free and bound antigen was achieved with a dextran-coated charcoal suspension. After centrifugation, aliquots of the clear supernatant were counted in duplicates in a 1450 MicrobetaPlus liquid scintillation counter. The Δ4A concentrations of unknown samples were determined from the standard curve. The detection limit was 0.5 ng/ml and the within and between assay coefficients of variation were 10.7 and 17.6%, respectively at an assay value of 13 ng/ml. The rate of enzymatic reaction was expressed as pmol of Δ4A formed per 10 min and per mg of protein. The value of maximum activity without inhibitor (control) was set at 100%. The IC50 values were calculated using non-linear analysis from the plot of enzyme activity (%) against log of inhibitor concentration. Abiraterone is an inhibitor of CYP17A1 for the treatment of docetaxel-treated castration-resistant prostate cancer. 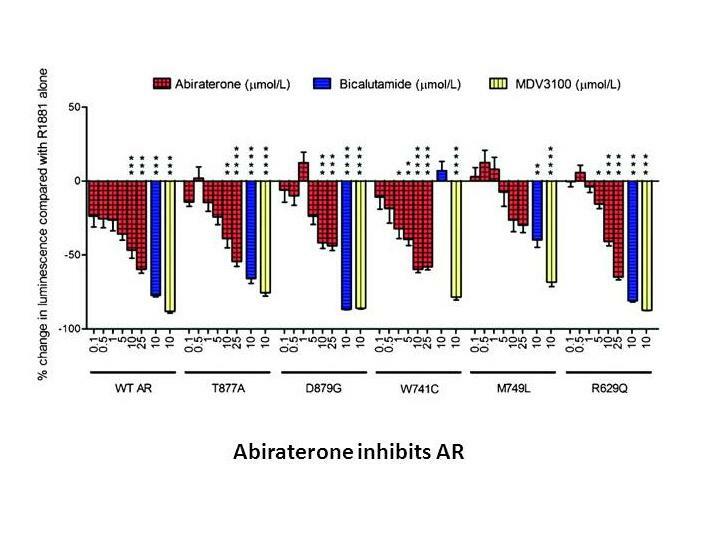 Abiraterone inhibits in vitro proliferation and AR-regulated gene expression of AR-positive prostate cancer cells. Administered by oral route at 10 ml/kg once daily for 3 days. After 3 days of oral treatment at 50 mg/kg per day, abiraterone acetate markedly inhibits VP (-14%) and SV weights (-37%) without affecting adrenal weight (-7%). It also significantly inhibited T secretion (-48%) and in turn increased LH concentration (192%). 2. Richards J, Lim AC, Hay CW et al. 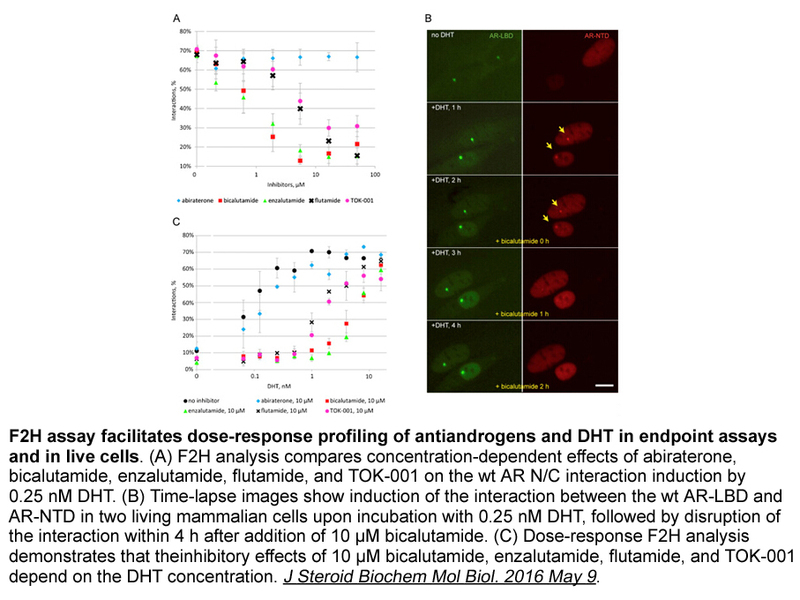 Interactions of abiraterone, eplerenone, and prednisolone with wild-type and mutant androgen receptor: a rationale for increasing abiraterone exposure or combining with MDV3100. Cancer Res. 2012 May 1;72(9):2176-82. doi: 10.1158/0008-5472.CAN-11-3980. 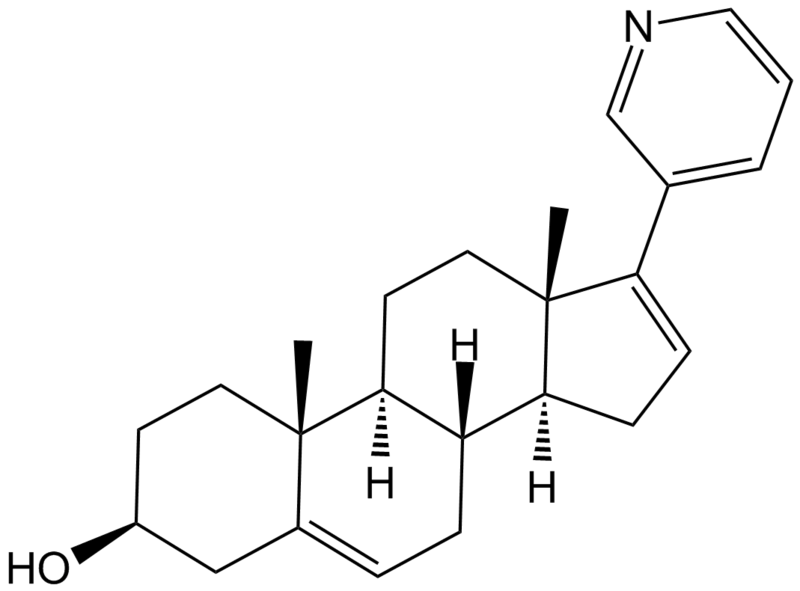 Abiraterone (17-(3-pyridyl)androsta-5,16-dien-3β-ol) is a potent small-molecule inhibitor of CYP17 complex (17 alpha-monooxygenase) which is a member of the cytochrome P450 family consisting of 17 alpha-hydroxylase and C17,20-lyase and catalyzing the 17 alpha-hydroxylation of intermediates of steroid biosynthesis involved in testerone sysnthesis. Abiraterone inhibits CYP17 complex by binding to the haem iron of CYP17A1, which forms a 60o angle above the haem plane and packs against the central I helix with 3β-OH interacting with aspargine 202 in the F helix. 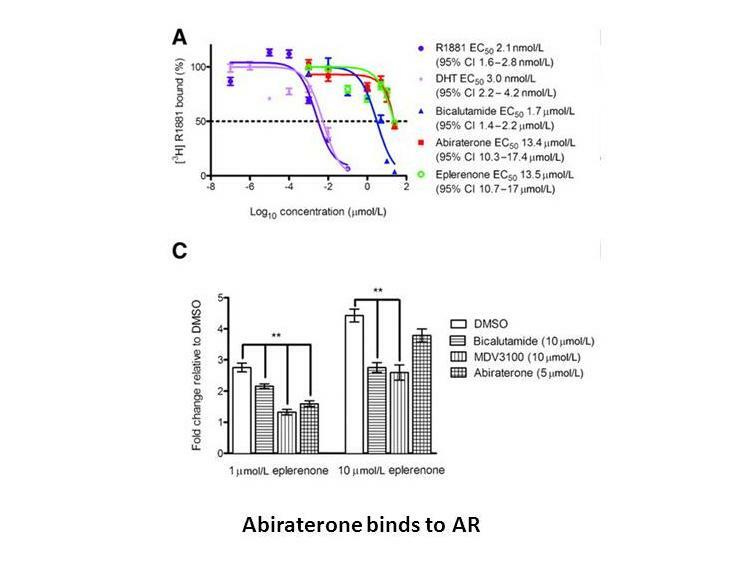 Abiraterone is currently being investigated to treat late stage prostate cancer, in which it consistently suppresses testosterone levels, leads to significant reduction in PSA level, and prolong life in patients with castration-resistant prostate cancer (CRPC).